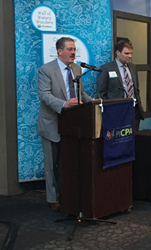 Richard Fischer and Joseph Zovko, Audit & Assurance partners at Pittsburgh accounting firm Louis Plung & Company, were honored at last night’s PICPA (Pennsylvania Institute of Certified Public Accountants) annual chapter meeting in Pittsburgh, PA.
It’s motivating to see our firm’s leadership so involved in the profession. [They] ... provide great examples of how to become more involved. Richard Fischer and Joseph Zovko, Audit & Assurance partners at Pittsburgh accounting firm Louis Plung & Company, were honored at last night’s PICPA (Pennsylvania Institute of Certified Public Accountants) annual chapter meeting. Richard Fischer, PICPA member since 1992, won the Pittsburgh Chapter Volunteer Service Award, and Joseph Zovko was appointed Secretary of the Pittsburgh Chapter Board of Directors. Zovko most recently served as Treasurer from 2015-16 and has been a PICPA member since 1995. The Volunteer Service Award has been given each year since 2008 to one PICPA member in each chapter who demonstrates outstanding leadership and commitment to the profession and community. Award recipients are chosen based on their involvement in and dedication to the chapter, implementing innovative projects, consistent leadership, speaking engagements, and community service. Each year, Fischer presents an average of six continuing education seminars to PICPA chapters statewide, and most frequently speaks on employee benefit plans, non-profit auditing, construction, and regulatory compliance. He is active in four committees, including Peer Review, Accounting & Auditing Procedures, Construction (Chair), and the Technical Committee of the Employee Benefits Plan Committee (Chair). Zovko took on a more active leadership role in 2014 when he joined the Executive Committee of the Pittsburgh chapter. In that role, he assisted in Chapter governance and advancement, which paved the way for continued involvement on the Board. He was appointed Treasurer effective May 1, 2015, and his new position as Secretary of the Board recognizes his commitment to the local chapter and PICPA as a whole. The appointment to Secretary was effective May 1, 2016. Each spring, PICPA hosts annual member meetings for each of its 11 chapters. Last night’s meeting for the Pittsburgh chapter was held at the Pittsburgh Zoo & PPG Aquarium, where approximately 100 local members attended. The Pittsburgh chapter covers Allegheny, Beaver, Greene, and Washington Counties and parts of Butler and Lawrence Counties. Louis Plung & Company, LLP is among the largest locally-owned certified public accounting firms in the Pittsburgh region. The firm’s geographic focus also includes New York, Ohio, Washington, D.C., and many other states. Louis Plung & Company delivers personalized service to clients in the real estate development, construction, retail, wholesale, employee benefit plan, non-profit, and manufacturing industries. In 2011, the firm co-founded FVL, a joint venture that specializes in forensic accounting and valuations. Louis Plung & Company is a member of AICPA, PICPA, and BKR International, an independent association of accounting firms with member firms in more than 70 countries. More information about the firm can be found online at http://www.louisplung.com.